Suffering that is not coupled with any redeeming good is one of our world’s more troubling, apparent glitches. It is particularly vexing for any theist who believes that the world was created by a supremely morally good, knowledgeable, and powerful god. Gratuitous Suffering and the Problem of Evil: A Comprehensive Introduction is among the first book-length discussions of theistic approaches to this issue. 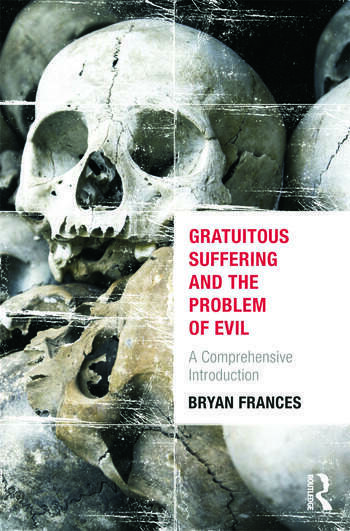 Bryan Frances’s lucid and jargon-free analyses of a variety of possible responses to the problem of gratuitous suffering will provide serious students or general readers much material with which to begin an extended contemplation of this ancient and contemporary concern. The perfect size and scope for an introductory philosophy class’s discussion of the problem of evil and suffering, and deliberately crafted to be approachable by all interested readers, Gratuitous Suffering and the Problem of Evil is philosophy doing what it does best: serious, engaged, rigorous explorations of even the darkest truths. The book offers many useful pedagogical features, including chapter overviews and summaries, annotated suggested readings, and eight-eight discussion questions. Bryan Frances is Associate Professor of Philosophy at Fordham University.